What you use to measure your success often defines your vision and your strategy. If your goal is more customers, you can get them, but they may not be profitable. Fleet Bank discovered that half of their existing customers are not profitable to the bank. If your goal is higher sales, you can boost them – but a what cost? 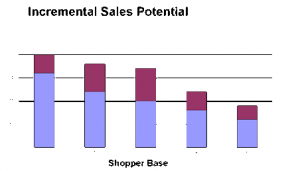 Many retailers have the idea that sales and discounts are the road to success. They may actually be the road to ruin. 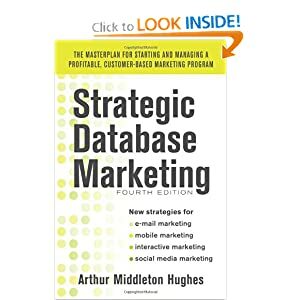 Get your customers to give you data, and build it into a database complete with purchase history. For a retailer, that means that you have to get your customers to use a plastic member card, or to record their credit cards with you so you can keep track of their spending. When you do this, you may discover that your top 20% of your customers gives you 80% of your profits. Everyone else has discovered the same thing. But you may also find, as the Fleet Bank did, that you cannot market profitably to these Gold customers. They are already giving you all their business in your category. They are “maxed out.” What should you do for them? Give them special services and attention so as to retain them. The people you should market to are those just below Gold. They have the ability to move up to Gold, if you will only encourage them. Building a relationship with customers only works if the customer benefits from the relationship. The trick in retailing, therefore, is to find things that you can do for customers that will modify their behavior in profitable ways. What you provide to customers has to be something that they will appreciate and value, but which do not cost you too much. In retailing, the margins are often thin. Safeway, for example, estimated how much they could afford to spend on customer relationship management. It came to about $2 per customer per month. $2 per month isn’t going to change anyone’s behavior. So what do you do? You concentrate your resources on those customers whose behavior you can most easily change, and whose changed behavior will be most profitable. These customers probably do a good deal of their buying somewhere else. If you make it worth their while, they could shift to doing more business with you. In this chart, we are tracking the performance of 5,000 newly acquired customers over three years. Their initial retention rate is 70%, which means that during the first year, 30% stop shopping with us. The retention rate goes up over time, as loyal customers are sorted out from disloyal ones. Their visits per week also go up with loyalty, as does the contents of their average shopping basket. This retailer spends 2% of his revenue on advertising and about $16 per customer per year on a plastic frequent shopper card system so that he can keep track of what customers are buying. Where i = the current interest rate plus a risk factor, and n = the number of years that you have to wait to get your hands on the future money. The lifetime value numbers are really very powerful measures. They include in a single set of numbers the retention rate, the spending rate, the costs of marketing, and the discount rate. By themselves, however, they are not as powerful as they will be when we use them to evaluate marketing strategies. To illustrate this, look at what Safeway is doing with their frequent shopper program. By analyzing customer spending patterns, Safeway discovered shoppers who never visited the meat or produce departments. For those shoppers alone, Safeway gave them a coupon for $1 off of anything bought in those departments. Result: meat and produce sales went through the roof. And, more important, these same people returned to shop in these departments two weeks later after the coupon campaign had terminated. Suppose that the retailer listed above were to adopt all or many of these programs. What could happen to lifetime value as a result? In this example the retailer has cut his advertising budget in half. With the resulting savings, he has boosted programs for his valued customers. What has he gained by this? The lifetime value in the third year has risen from $143 to $186. What does this really mean for a chain store? Assuming that the chain has 200,000 customers who are using the frequent shopper card, and getting the relationship building programs described, the profits to the chain in the third year will be more than $8 million. This is real profit, since the costs of the new programs have already been factored in. These charts don’t tell you that the programs will be a success. Poor execution can ruin any well laid plan. But lifetime value analysis tells you that your programs can be successful. Many programs fail because this type of analysis has not been done in advance. Increasingly marketers are realizing that the techniques used to measure success guide their strategy. Lifetime value, as a measurement, is preferable to basing your strategy on numbers of customers, market share, or total sales.